My main interest lies on the investigation of biodiversity in general with a focus on vertebrate organisms. 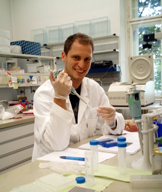 While I seek to expand my horizon of global vertebrate diversity constantly, my Phd work aims at characterizing the native Austrian fauna by means of genetic barcoding, setting up a reference database and optimizing necessary workflows, as well as mastering modern instruments (Keyence Digital Microscope) for the investigation of thus far unresolved taxonomic groups or cryptic diversity. In my work I apply various, mainly molecular methodologies (classic Sanger and next generation sequencing) to study species delimitation, speciation, cryptic diversity, but also phylogeographics and phylogenetics. Due to cooperation with several dear colleagues, I am also able to peek at other groups of animals like African cichlids, ectoparasitic Monogenean Gyrodactylus or Adriatic triplefins (Tripterygion tripteronotus) and involve myself in population genetics and species radiation events.